The Cyber Intelligence Sharing and Protection Act, also known as the CISPA, is headed to the House of Representatives this week. Scheduled for debate on Thursday, April 26, the CISPA bill—which will be deliberated alongside another cybersecurity bill known as the Cybersecurity Enhancement Act (PDF)—is expected to see a vote no later than 3pm (ET) Friday afternoon. As the time rapidly approaches, the bill’s opponents have wasted no time making their voices heard. In fact, one petition against CISPA posted on Avaaz.org has already accumulated more than 750,000 signatures. And that’s just one out of dozens of anti-CISPA petitions being circulated by rights groups. Joining the ranks of the opposition this week, former BitTorrent executive John Pettit added his name to an open letter published Monday night expressing concern over the cybersecurity bill. Any time you’ve got a bill that has extensive powers and very vaguely worded definitions, that gives immunity to people for things that used to be illegal, you’ve got to look at how this bill could be used negatively. You’ve got to look at the history, and the history here is clear. The Patriot Act, for instance. If you give people broad powers, they’ll use them for things they were never intended for. While some argue that CISPA and SOPA couldn’t be more different, close scrutiny of both bills reveals that the potential consequences of both bills are all but identical when it comes to civil liberties. Although each bill bears its own unique posturing—CISPA as a cybersecurity bill, SOPA as a copyright bill—both effectively encompass one another in terms of the potential casualties of their passage. The former BitTorrent executive is the latest in a long list of technology industry experts—many of whom have signed onto the same open letter—to speak out against CISPA. However, they aren’t the only ones getting out in front of the opposition. With election season coming into full swing, CISPA has provided an opportunity for a couple White House hopefuls to inject a modicum of populism into their campaigns. After wavering on the issue initially, the Obama administration has taken an official stance on CISPA as the bill makes its way to the House floor this week. News of the President’s official stance broke nearly lockstep with a similar announcement from somebody who wants his job next year. Their pathos typical of campaign rhetoric notwithstanding, Paul’s words do still highlight real causes for concern no matter where one falls along the political spectrum. And although it might not be Big Brother at our doorsteps, the current construction of CISPA—with its sweeping language and broadly defined terms—does little to prevent the onset of such hysteria. CISPA Bill Amendments: Are They Enough? After meeting last Wednesday to discuss the bill, the House Intelligence Committee announced “huge progress” in making CISPA more palatable to lawmakers and their constituents. Speaking to The Hill after the meeting—which also involved Google “working behind the scenes,” according to the report—committee chairman Rep. Mike Rogers said that Google has been “helpful and supportive” in determining the “right language” for the controversial bill. This is particularly interesting considering Google is one of the few big names in tech yet to take an official stance on CISPA. Further, none of the amendments proposed have prevented the NSA from being able to directly collect Internet records on of personal activity. Rather, an amendment simply suggests that the Department of Homeland Security be copied on information sent from private companies to the military and other, less publicly accountable entities. Lastly, concerns of what the information will be used for once it reaches the NSA and others is yet to be defined. No regulations have been placed on the information’s use. And no legal safeguards or means of legal recourse have been installed to those who might be negatively affected by its misuse. In other words, it appears that little, if any progress has been made, at least as far as publicly voiced reservations are concerned. Are you following the CISPA situation? If so, tell us your thoughts on the bill. What would you change? What parts, if any, do you support? Share your input in the comments below. 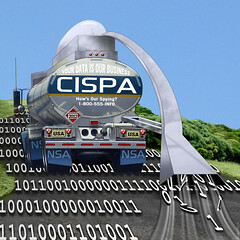 For more on the CISPA bill . . .